RÖSER D, MOLA-YUDEGO B, SIKANEN L, PRINZ R, GRITTEN D, EMER B, VÄÄTÄINEN K, ERKKILÄ A. 2011. Natural drying treatments during seasonal storage of wood for bioenergy in different European locations. 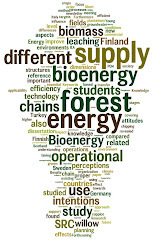 Biomass & Bioenergy 10(15): 4238–4247. Research into the methods of producing high quality wood chips for a rapidly growing energy sector is becoming increasingly important. For example, small wood chip heating plants require high quality wood chips to ensure efficient operation, thereby minimizing maintenance costs. Moisture content is considered to be an important quality parameter regarding wood based fuels. The objective of this study is to investigate methods to promote the natural drying of wood for bioenergy purposes. The effects on the drying process through covering the wood piles and partial debarking of stems were tested in order to identify methods to reduce the moisture content of the woody material in the storage. Drying trials were established in Finland, Italy and Scotland, utilizing tree species typically used for energy purposes in each area. The results show that natural drying is a viable and effective method to enhance the energy efficiency of wood based fuel products in all the regions studied. Furthermore, by adapting current harvesting methods and storage procedures even better results can be achieved. In addition, the results also indicate that broadleaved trees dry more effectively, if some partial debarking is carried out and that covering of piles is of utmost importance in Scotland and Finland. ► Natural drying is an effective method to enhance efficiency in the wood-fuel chains ► Broadleaved trees dry more effectively when partial debarking is done ► In Scotland and Finland a method for covering of piles is of utmost importance.